Among U.S. car shows, there's been an increasing trend towards stuff you can actually buy, with bizarro concepts largely killed by the bankruptcy. There was no shortage of real cars at this year's Detroit Auto Show, even if that meant there were no spectacular advancements in alternative energy. Over at Yahoo! 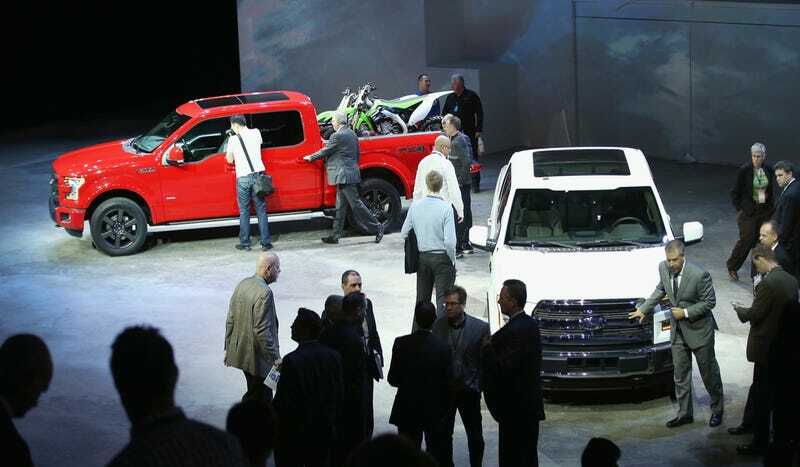 Autos, Neal Pollack said U.S. automakers didn't move the game on enough at the 2014 Detroit show. And that's a problem considering that they stared in the face of death just five years ago. American cars are too big, and they're not fuel-efficient enough. As I walked through the American show halls this year, I saw mostly toys. When the Big Three try to address that problem, they end up with disasters like the Ford C-Max or the new all-electric Cadillac ELR, machines beloved by neither fuel-economy nuts or American car lovers. The overall strategy has brought the American car industry back from the abyss in the short-term, but it doesn't strike me as a recipe for extended health. The big story of 2014 Detroit may have been trucks, with the Ford F-150 and GMC Canyon represent truck thinking that didn't exist before Carpocalypse. Ford is all about weight savings with its bread and butter vehicle, dropping weight with a massive amount of aluminum. And this isn't even the first thing they've done to the F-150 to reduce weight and add MPGs. At the New England Auto Show Thursday, Ford execs were proud to say they've shifted more than 400,000 Ecoboost F-150s so far. Clearly the market isn't afraid of it. The fact Ecoboost is going to the 2015 Ford Mustang is another huge vote of confidence for Ford's downsizing. The GMC Canyon should've been dead because it's hard to see why anyone wouldn't buy a midsize truck when they could have a full-size one for not much more money. Yet the Canyon and Chevy Colorado represent GM's listening to a demographic other truckmakers have abandoned. Sure, there's the neat surprise of a diesel option. More importantly, these are trucks that don't occupy nearly the same space on the road as a full-size model. U.S. automakers really have embraced the philosophy that bigger doesn't mean better. And while the 2015 Chrysler 200 is only rated at 35 MPG highway, it does bring a 9-speed automatic and a trick AWD system to the midsize class – and could reasonably give some entry-level premium cars a run for their money on style and technology. Plus, Chrysler is also marketing the Ram 1500 EcoDiesel, likely to be one of – if not the – most fuel-efficient light-duty truck on the market. Lighter, smaller vehicles are better for everyone – that's the message that American drivers are slowly getting. Some of you make fun of little crossovers like the Buick Encore, but it's exactly what a lot of the population wants and, crucially, all the crossover they need. I'm convinced the U.S. automakers understand we're living in different times, they're just trying to figure out how to navigate them, and doing it in different ways. Let's not forget Tesla, though. Their crazy fantastic Q&A in Detroit shows how far they go against automaker convention. There's a palpable feeling in the room that marketing execs from other companies wish they could do things like Tesla. And maybe they will one day. There are still problems. GM has priced the Cadillac ELR at an absurd level. Chrysler needs to stop pretending the Fiat 500e doesn't exist and needs to get more than 35 MPG out of the new 200. And Ford needs to get its Ecoboost quality problems and fuel economy claims in check. But these aren't fatal flaws, especially when the products themselves are good. Pollack himself is a huge fan of the Prius, but the math shows that changes to the F-150 could easily trump the cost savings of people switching to the hybrid. In the early 1990s when I was growing up, American cars largely meant minivans, trucks and rental cars. The Geo Prizm was probably the most American car that anyone I knew bought. People who were my parents' ages owned maybe one American car in the '70s and refused to have one again. Yet those people are doing themselves a disservice by insisting American automakers can't make an economical and innovative car anymore. In some ways, they're actually taking more risks than the Japanese and Korean companies. But being innovative doesn't mean to just roll out hybrids, limited production EVs and far-fetched fuel cell concepts. That was the old way of showing the public you have a new way of thinking. Getting more MPG out of traditional segments with more conventional technologies is what's going to resonate most with the people who buy new cars. This year, U.S. automakers didn't promote new ideas with low-volume vehicles. They have those already. What mattered were volume products that brought new thinking or good, old ideas back to the core of the market. And that kind of green thinking is what the industry needs today.